One of the main disadvantages of copter drones is their low energy efficiency: in order to create and maintain a sufficient lift, a lot of energy is needed, thus decreasing the endurance of the UAV. That is a serious obstacle for anyone trying to develop copter drones for parcel delivery. The solutions for UAV parcel delivery proposed so far include increasing energy efficiency of copters, and multimodal transport systems like the van-drone, which combines the advantages of both vehicles. Master’s students Cyriel Notteboom, Menno Hochstenbach and Maarten Verbandt from University of Leuven had different idea. When they were given the task for their Master thesis to build a drone, they were not told not to create something extraordinary. But it seems they did. 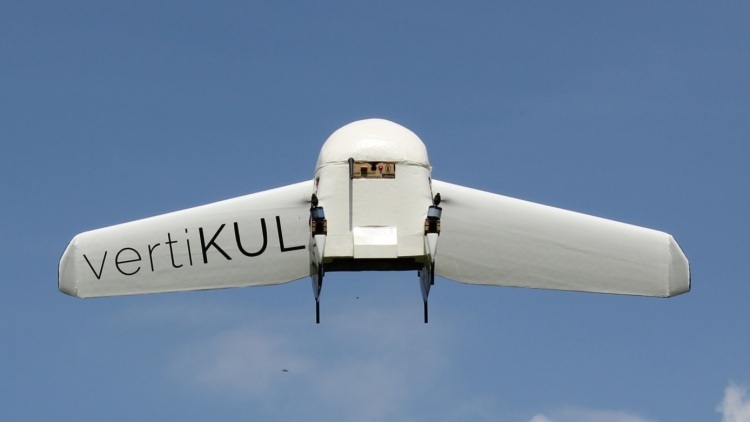 After one year of intensive work, they came out with VertiKUL, a vertical take off and landing (VTOL) UAV that takes off like a helicopter, but flies like a fixed wing aircraft. VertiKUL can carry up to 1kg (~2 lbs) to a distance of 30 km (~18,5 miles) with a single battery charge. It takes off vertically with the help of four propellers, and then, in midair the drone rotates its nose 90° forward, making the transition from take-off to flying mode. The stability during transition phase is achieved by independent propeller adjustment. When rotation is finished, the drone continues to fly like a conventional aircraft, using wings to increase energy efficiency during forward propulsion. It could be a while before VertiKUL becomes a parcel delivery workhorse, however. It still has to solve some issues with landing in high winds, and negotiating changing weather conditions. And of course, there are legal challenges to be overcome before people start getting their books delivered to their back patio. But as a proof of concept, this UAV might just be the thing Amazon is looking for, and will be the next generation of delivery drones they are testing. Interesting articles about VertiKUL can be found on University of Lueven webpage, and at www.geek.com. Image courtesy of University of Lueven. Video courtesy of Menno Hochstenbach.